Everclear is an American rock band formed in Portland, Oregon, in 1991. The band was formed by Art Alexakis, the band's lead songwriter, vocalist, and guitarist; and for most of the band's height of popularity, consisted of Craig Montoya on bass guitar and Greg Eklund on drums. After the limited release of their independently-released debut album, World of Noise, the band found success with their first three albums on Capitol Records: Sparkle and Fade, So Much for the Afterglow, and Songs from an American Movie Vol. One: Learning How to Smile, which were all certified platinum in sales. However, the following two albums Songs from an American Movie Vol. Two: Good Time for a Bad Attitude and Slow Motion Daydream, were not as well received, and as sales suffered, Montoya and Eklund left the band shortly after in 2003. After a brief stint of solo performances, Alexakis decided to push forward with the Everclear name, finding new musicians to perform with and releasing two more albums, Welcome to the Drama Club and Invisible Stars. In 2012, Alexakis started a 1990s nostalgia tour, named the Summerland Tour, which occurs every summer with Everclear and other 1990s alternative rock bands. In April 2015, the band released a ninth studio album, entitled Black is the New Black. In a single month in 1992, Shindig failed (when its distributor went bankrupt), Colorfinger broke up, and Alexakis learned that his girlfriend was pregnant. Seeking a change of location, Alexakis and his girlfriend moved to her hometown, Portland, Oregon. There, he placed an ad in local music weekly The Rocket, which earned two responses: bass player Craig Montoya and drummer Scott Cuthbert. The name Everclear was chosen as a reference to the infamous grain alcohol. In an interview with The Discovering Alcoholic, Alexakis called it "pure, white evil" for its deceptive nature. The new band began recording in a friend's basement, essentially bartering for recording time with musical gear and whatever limited funds they could scrounge up. The sessions culminated in two releases: the Nervous & Weird EP and the band's first full-length release World of Noise, both released by Portland's Tim/Kerr Records in 1993. Frustrated by Tim/Kerr's limited resources, Alexakis hired independent promoters to help push the album. The album's first single, "Heroin Girl", received some modest airplay via MTV's 120 Minutes, but was generally missed by the mainstream. However, near the end of 1995, the second single "Santa Monica" found a strong audience via the burgeoning alternative radio format, which eventually carried over to mainstream success. The album subsequently was certified platinum. However, two ensuing singles, "Heartspark Dollarsign" and "You Make Me Feel Like a Whore", failed to find a wide audience, and the band ended 1996 fast at work on their second full-length album. As Sparkle and Fade reached its audience, Everclear had to endure consistent comparisons to Nirvana, particularly given the album's subject matter and drug references. Following a show with the Foo Fighters at the end of 1995, Dave Grohl told MTV News that he did not think that Everclear sounded like Nirvana, noting that Bush sounded more like Nirvana than any other band. By the end of 1996, the band had nearly completed the album, which they planned to release under the title Pure White Evil. Alexakis, however, was dissatisfied with the results, and decided to work on more songs for the effort, including "One Hit Wonder" and the eventual title-track to the album, So Much for the Afterglow. The songs "The Swing" and "Otis Redding" were cut from the Pure White Evil Sessions and were not on So Much for the Afterglow. Eventually they were released: the former on the soundtrack album for Scream 2 and the latter on Songs from an American Movie Vol. One: Learning How to Smile. So Much for the Afterglow was released in October 1997. The first two singles from the album, "Everything to Everyone" and "I Will Buy You a New Life" performed modestly, but helped begin a slow build for the album, while "Local God" was featured in Baz Luhrmann's Romeo + Juliet in 1996 as well as on the soundtrack. The band completed a US tour at the end of the year, and started 1998 with a tour of Australia. The Australian tour, however, was an unexpected disaster. At a show in Wollongong, someone threw a shoe at Alexakis, knocking loose a few of his teeth. Two nights later in Melbourne, someone threw a lit explosive on stage, which exploded and burned a stagehand. Tensions erupted backstage, with touring guitarist Steve Birch refusing to continue, and Montoya getting into a heated argument with Alexakis. In interviews for VH-1's Behind the Music, the band related that they nearly broke up that night. The band decided to cancel the remainder of their tour following a final show on the Gold Coast, during which Alexakis was hit with a shoe (while the crowd was singing him "Happy Birthday") and Montoya's acoustic bass guitar was stolen. 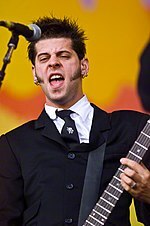 Montoya declined to join the band for the ensuing tour of the United Kingdom, with then-bass-tech David LoPrinzi filling in. Everclear did not return to Australia until 2012. Afterglow provided the band their only Grammy Award nomination to date, a Best Rock Instrumental nod in 1998 for "El Distorto de Melodica". Later that year, the band won Billboard's Modern Rock Band of the Year Award. Though Afterglow never charted higher than No. 33 on the Billboard album chart, the album reached double-platinum status at the end of the year. Following the success of So Much for the Afterglow, Alexakis decided to step back from the Everclear sound and record a solo album of more pop-influenced songs, and brought in Everclear touring musicians David LoPrinzi, Brian Lehfeldt, and James Beaton to perform on the recordings. Unhappy with the results of the initial sessions, Alexakis decided to bring in Montoya and Eklund and transform the effort into an Everclear album. The results were released as Songs from an American Movie Vol. One: Learning How to Smile in July 2000. The album yielded the band's most successful single, "Wonderful", and eventually reached platinum status. The song "Wonderful" was also notably used as the graduation song for the Columbine High School class of 2000, who the year before suffered from the Columbine High School massacre. Proclaimed as a "return to rock", Songs from an American Movie Vol. Two: Good Time for a Bad Attitude was released just four months after Vol. One in November 2000. Unfortunately, the promotional push for Vol. Two while still in the throes of supporting Vol. One confused much of the music-buying public. Learning How to Smile's second single "AM Radio" was released barely weeks before the release of Vol. Two, leaving some stores to mistakenly label the song as the first single from Vol. Two. The confusion was amplified by the band's decision to accept an opening slot for Matchbox 20 in the months after the release of Vol. Two, a somewhat awkward billing for a band who was trying to support a hard rock album. Free of a major label, Alexakis spent the ensuing year and a half slowly recording material for a new Everclear release. He admitted that the time after the breakup of the original lineup served as a "wake up call", during which he suffered his third divorce and filed for bankruptcy and did not retain sole custody of his family pet, a dog named Scooby. The new lineup was signed to Eleven Seven Music. Everclear released Welcome to the Drama Club on September 12, 2006, the title being in honor of their affection for the stage. Two songs were released from the album, "Hater" and "Glorious". On October 6, 2009 the band released In a Different Light, a collection of re-recordings of old Everclear songs in a more acoustic fashion. The collection also featured two new Everclear songs, "Here Comes the Darkness", which was actually a leftover track from Welcome to the Drama Club, and "At the End of the Day", which Alexakis had written and performed with Marion Raven. In June 2012, Everclear released their first album in six years, entitled Invisible Stars. In support of the album, Alexakis announced the Summerland Tour, a '90s nostalgia tour featuring Everclear themselves, Sugar Ray, Lit, Marcy Playground, and the Gin Blossoms. In 2013 the Summerland Tour returned, this time consisting of Everclear, Live, Filter, and Sponge. Everclear announced Summerland 2014 consisting of Everclear, Eve 6, Soul asylum, and Spacehog. During the 2014 Summerland tour, Everclear announced a forthcoming album release, and included in their set lists for the tour a new song to be on the new album. The resulting album, Black is the New Black, was released in April 2015. In 2016 independent record label Intervention Records reissued So Much for the Afterglow and Sparkle and Fade for the first time. Both albums were pressed on 180-gram vinyl and were mastered from high-resolution archives. ^ a b c d e f Strong, Martin C. (2000). The Great Rock Discography (5th ed.). Edinburgh: Mojo Books. p. 326. ISBN 1-84195-017-3. ^ The Discovering Alcoholic (April 30, 2009). "Art Alexakis of Everclear at The Discovering Alcoholic". Discoveringalcoholic.com. Retrieved July 18, 2011. Wikimedia Commons has media related to Everclear (band). This page was last edited on 27 March 2019, at 23:31 (UTC).